It was always a most unlikely collaboration: in one corner, the colourful idol outfit MOMOIRO CLOVER Z and the other corner, the classic rock outfit KISS. The finished product is ‘Yume No Ukiyo Ni Saitemina’, a song that was penned by Kiss frontman Paul Stanley and Greg Collins (composer and former Kiss producer) along with lyrics by Yuho Iwasato. If Iwasato’s name sounds familiar it’s because he’s collaborated with Momoclo in the past on lyric-writing duties, notably ‘Saraba Itoshiki Kanashimitachi yo’ from 2013’s 5TH DIMENSION album. As a lyricist, Iwasato’s worked with the likes of legendary composer Yoko Kanno and is responsible for theme song lyrics for some of the most well known anime titles in recent history, including Cowboy Bebop, Cardcaptor Sakura and Macross Frontier. Anime is also a vital component of the video for ‘Yume No Ukiyo Ni Saitemina’. Fans of bonkers anime series Kill La Kill will recognize the inimitable style of Sushio at work. This isn’t the first time that Sushio has worked with the band. Keen-eyed Momoclo fans will recall the warzone setting of the video for 2012 single ‘Otome Sensou’. The combat outfits used in that video were designed by self-confessed Momoclo fan Sushio. 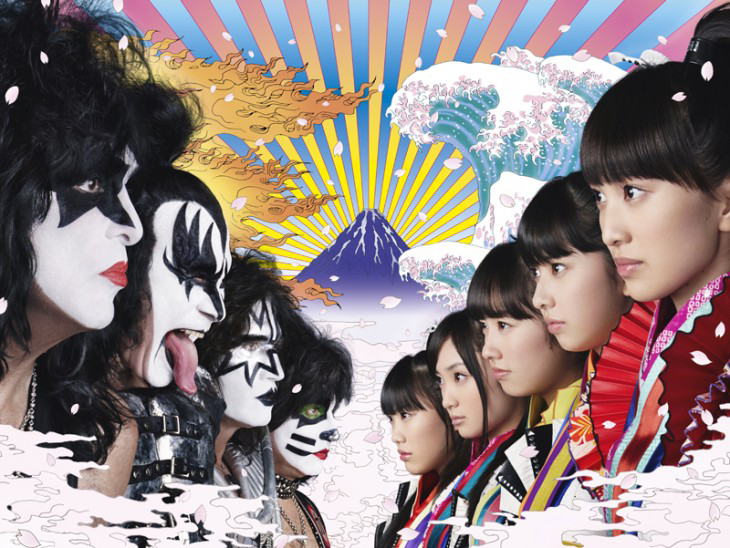 The video itself, in which the diminutive members of Momoiro Clover Z square off against the members of Kiss. Was directed by Masatsugu Nagazoe (who previously worked with the outfit on ‘GOUNN’). It’s a visual feast as Sushio’s style is a perfect fit for the widescreen primary-coloured pop of Team Momoclo. BABYMETAL’s surprising success with combining idol music with metal has clearly cast its influence wide (see also the recent Oricon chart toppers Mask Girls). To illustrate how influential the metal trio are, Yuyoyuppe and Narasaki (who both worked on some of the songs for BABYMETAL’s debut album) have also been brought onboard to provide a new arrangement of Kiss classic ‘Rock and Roll All Nite’ (Legendary guitarist Shinji Wajima of metal outfit Ningen Isu also performs on the song). The sinister guitar rhythms of ‘Yume No Ukiyo Ni Saitemina’ slot in perfectly with Momoiro’s theatrical vocal style. In fact it’s difficult to think of another rock outfit that could carry this off as well as Kiss who have been doing a spectacular job of combining theatre with rock for 40 years. This isn’t quite the first time that Kiss has had an impact on the Japanese music industry either. The manga series Detroit Metal City takes its title from one of the rock outfit’s singles (‘Detroit Rock City’) and a 2008 live film adaptation features a special appearance by Gene Simmons (he of the long tongue – and Polaroids! – fame) from Kiss. Kiss have also produced their own version of ‘Yume No Ukiyo Ni Saitemina’ specifically for Western audiences. ‘Samurai Son’ presents a different arrangement of the song that features Kiss front and centre, while Momoiro Clover Z bring up the rear on backing vocals. ‘Samurai Son’ will appear on both the special Kiss version of the single and also on the forthcoming Best Of Kiss 40 album. Kiss are also due to perform at Tokyo Dome on 3rd March as part of their 40th Anniversary tour – and Momoiro Clover Z will be joining them on stage. If that wasn’t enough Kiss/Momoclo action for you then a special website has been set up to promote the forthcoming release. The battle website invites people to vote for either Momoclo or Kiss members via Twitter and Facebook. Depending on which band wins the stats war in a 25-minute period, the page offers up either a preview of ‘Yume No Ukiyo Ni Saitemina’ or ‘Samurai Son’. ‘Yume No Ukiyo Ni Saitemina’ is released 28th January. It will also be available via iTunes in 120 countries.